Training your cat can be frustrating. Cats may be intelligent, but they are also stubborn. Unlike dogs, they really don’t care if they please you or not. It’s not a slam, it’s just the way most cats are. They are highly independent, and even the friendliest cat is a force unto herself. So it’s much more time intensive and much more frustrating unless you have years of experience. Today, we’re only going to go over one very key part of training your cat – do not use physical correction. I recently came across a post in a cat forum from an owner whose cat wouldn’t stop getting on the kitchen counter. The owner was understandably skeeved out by this. After all cats are always in the litter box. The owner didn’t want the cat getting her litter box paws all over her food spaces. To make a long question short, she asked about spanking her cat. I knew immediately I had to write about how much of a bad, bad idea it is to use physical correction. As with all animals, physical correction is NEVER an option. Some people still spank their kids – we won’t get any deeper into that can of worms – as a form of punishment. Many people also view their pets as children. So human logic would dictate that spanking our pets would be an option for training. It’s not. Unlike humans, cats and dogs, have no concept of that sort of punishment. That’s why negative reinforcement doesn’t work. Dogs and cats only learn through repetition and reward. They do not understand something like spanking or hitting. Whatever your thoughts on corporal punishment in kids, in animals, it’s just cruel. They don’t get it. Hitting any pet, but most especially cats, is never a good idea. It fosters fear, aggression, and a generally stressful existence for your pet. If a cat is hit, chances are the home life will go downhill quickly. Fear is a very real result of hitting any animal. Depending on your cat’s personality, hitting her could cause her to become one of those cats that only comes out from under the bed when no one is around or zips away whenever she sees you. 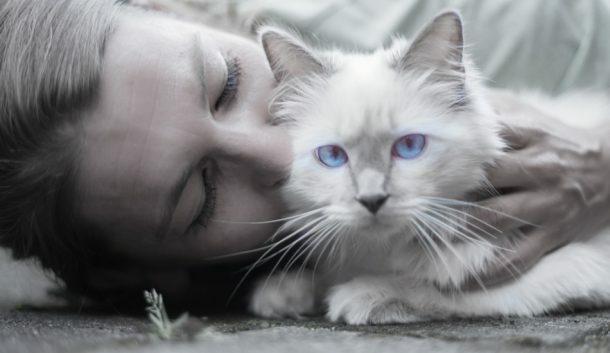 Hitting the cat teaches her that her owner is a source of aggression and can cause a permanent fear response. Much more so than dogs, cats will not put up with any sort of shenanigans. Training your cat with physical correction could result in a response that is the total opposite of fear – aggression. 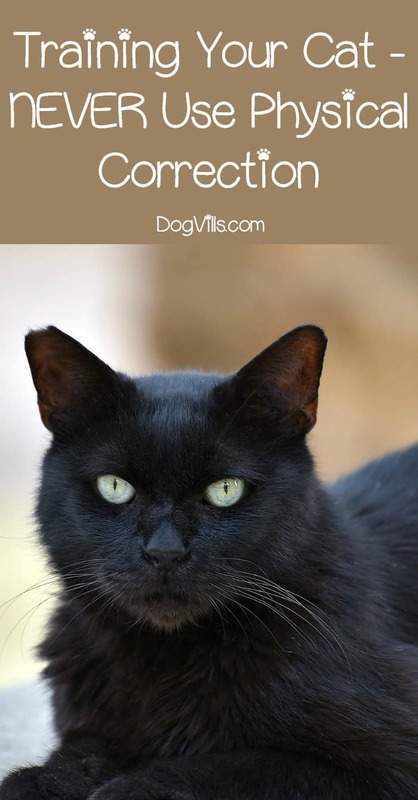 If you have a very confident and stubborn cat or a cat that is already of the “don’t mess with me” personality type, hitting the cat could cause her to turn the tables. A cat that has had it with being smacked could claw or bite. Outside of fear or aggression, using physical force when training your cat could also result in other forms of acting out. The cat might start to urinate and defecate outside of the litter box. Some cats also respond to stress by over-grooming which can lead to hair loss and skin issues. Whatever your thoughts on spanking as a punishment for children, at least they understand why it’s happening. Dogs and cats don’t. Cats are especially apt to develop behavioral issues if they are smacked or spanked as a form of correction. Remember, training should never involve punishment. Animals are trained through repetition and praise. Anything else is just a human venting their frustration. So remember the golden rule when training your cat – never use physical correction. Do you have any tips for training your cat? Share them below! Cats are too fragile. I find petting to be a great win over with cats.